The Unbearable Lightness of Liz B. While it seems to be de rigueur for Republican candidates for any public office in Montana to avoid making any statements about the policies they’d pursue if elected to office, Legislator Liz Bangerter, who is seeking election in House District 82 has taken that strategy to an absurd level. Witness her latest mailer, a massive monstrosity of nothingness. On the inside, voters are treated to a series of images with slogans like “Representing Our State,” a bold and provocative statement one might find in a children’s book about governing. It’s also probably telling that Ms. Bangerter also includes the slogan “Protecting the Outdoors” while clearly standing on a highway—one she and her party no doubt intend to install in the Bob Marshall Wilderness once they privatize it. Given that Bangerter voted both to diminish Montana’s constitutional protection of a clean and healthful environment and access to waterways for those seeking recreation in Montana, it’s a dishonest attempt to manipulate voters with an empty catchphrase. So that’s just one side of the document. Surely, the reverse includes some details about either what Representative Bangerter has done in two terms in the Legislature or what she hopes to accomplish in a third, right? Not so much. Instead, voters are treated to a deeply informative sepia-toned photograph of the Helena area. (I placed a full size iPad next to the brochure to give you a sense of just how big and empty it is). 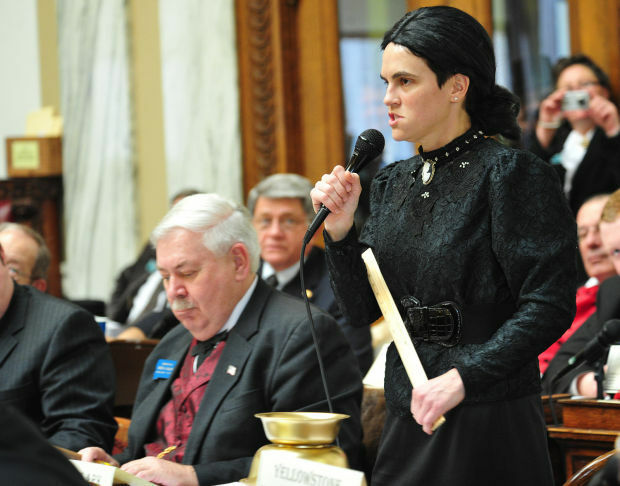 I know when I am choosing a legislator to represent me one of the most important things I look for is a candidate who can use Photoshop to make a picture look old-timey, just like the values of her party. Despite all that space, Representative Bangerter found the smallest font available to tell voters in her new district that she’s a Republican—and no room at all for any substance about her campaign, values, or priorities. There’s a reason a candidate with two terms in the Legislature would refuse to talk about her record and her votes: they’re badly out of line with the values of the people she hopes to represent. The next time Ms. Bangerter drops by your house, ask her why she won’t tell HD82 voters what her real priorities are and wants to diminish her connection to the radical Republicans who want to destroy public education, public lands, and public trust in Montana. It’s commendable that Representative Bangerter is willing to listen to constituents, but it’s about time she starts talking to them, too. I spoke with Ms. Bangerter after she left a cute note on our door when we were out. I asked her specifically about: womens’ right to choose with respect to contraception and abortion; teaching of evolution in our public schools; promoting fossil fuel development on the Rocky Mountain Front and elsewhere; the proposed mine near White Sulphur, and a few other issues I can’t recall. On every point her responses were diametrically opposed to the views we hold, so I assured her that we would be voting for Moffie Funk for HD 82. She is one of those politicians who clearly hold extreme right wing views but pretend to be moderate. Moffie on the other hand – well we all know where she stands!!!! For us. Wanna know who’s funding all these kooks? Scary, scary folks, that’s who! I am so sick of these christofascists and their call for return to a Holy Buybull based nation! Crazy, anti-American stuff. And it’s important for people to understand what we’re up against here. Here is an excellent article on the Wilks brothers. And lest we forget, they are fast becoming one of the largest land owners in Montana. Scary indeed. They are some real sickos. I think it’s vital for people to understand just how scary these wingers are, and how influential they’re becoming. From the article: It’s important stuff, which I tried to post at cowgirls, but I can’t seem to post it. The report said that 70 percent of Montana Republican legislators got contributions from the Wilkses. The report said that 70 percent of Montana Republican legislators got contributions from the Wilkses. (AP noted that all bills aimed at regulating fracking in the 2011 legislature were killed by Republican-led committees.) According to the Institute, 64 of the state-level candidates the Wilks family supported won—63 legislators and Attorney General Tim Fox. The Wilkses also gave heavily to Dennis Rehberg, a former Republican U.S. congressman from Montana who gave up his seat to mount an unsuccessful challenge against Sen. Jon Tester in 2012, and to Steven Daines, the Republican who won the House seat vacated by Rehberg and who is now running to for U.S. Senate.